Jerome Powell burst the Everything Bubble… and now he’s desperately trying to put it back together again. Having generated the single largest mis-allocation of capital in history from 2008-2016 by manipulating bond yields to extraordinarylows, the Fed, lead by new Fed Chair Jerome Powell decided it’d be wise to embark on the single most aggressive tightening schedule in history. I started warning that this would blow up in spectacular fashion as early as July-August 2018. The issue was not the Fed tightening, but the pace at which it was tightening. There was no real reason for the Fed to raise rates and engage in QT at the pace it did. Only a fool would think that doing this wasn’t going to cause some serious damage to a financial system that was more leveraged than any other time in history. Fast-forward to October and the market imploded just like I said it would. It was only by completely abandoning ANY and ALL pretense of normalization that the Fed managed to put a Band-Aid over a now rapidly collapsing Everything Bubble. We’re about to find out. Stocks ramped higher yesterday on MASSIVE manipulation (NO real buyer piles into stocks like that), but the fact is that the bond markets are telling us that the Fed is trapped. The yield on the 10-Year Treasury is telling us that the economy is in serious trouble (blue line). 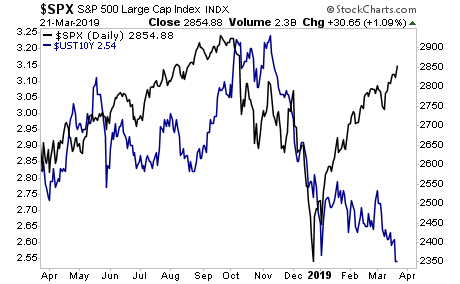 It’s telling us that stocks, which are discounting a MAJOR rebound in growth, are not only delusional, but ripe for a crash. Stocks could easily erase their entire rally from the December lows. What would Jerome Powell do then? 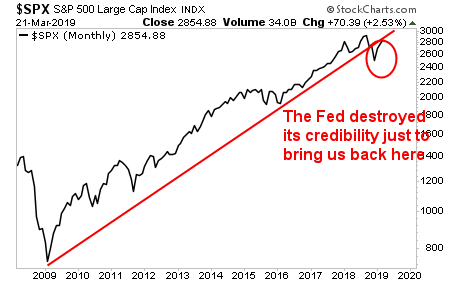 In chart terms, the Powell Fed destroyed its credibility just to bring stocks back to their broken bull market trendline.